It’s almost July and that means that on the 1st My Time Made Easy ™ LLC will have another amazing release of coordinating products for you!! This month we have 2 Pretty Packaging Templates, 1 amazing & unique Pretty Impressions Stamp Set, 2 Pretty Pieces Cut Files, and 3 Pretty Printables Digital Paper Collections!! Today we will be sharing a Group Post to peek some amazing projects that are being released tomorrow July 1st! Also be sure you check out the MTME Blog!! The Pretty Pattern Sketch Team has posted a NEW! Sketch and samples today! Also check out the latest from the Pretty Palette Color Team has done! Now let me share my project samples and some information about some of what we are releasing this month! I’m very excited to share this template and stamp set combination with you all! 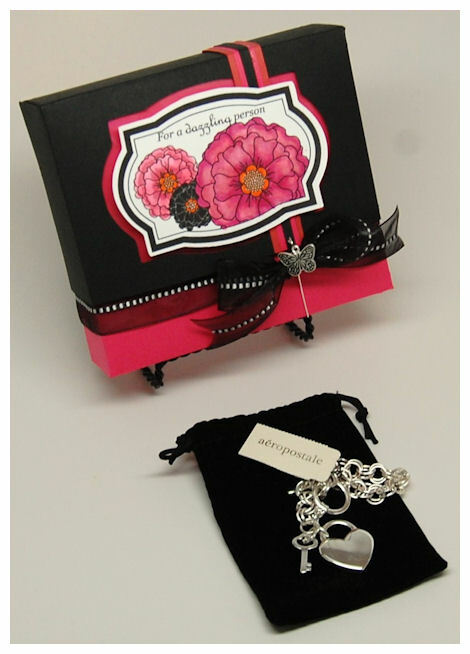 I designed a stamp set that was designed with the jewelry maker in mind, or those who love to gift it! The idea for this set came from a dear friend of mine Sonia, who makes and sells jewlery at Sonia Jung Designs! I have gotten many of her stunning creations from her store, and love to give them the proper presentation! The stamp set is called Be Dazzled , and I will get to the details on that, following the template information. The template is called For Keeps, and it offers a dual base option! So like another 2 for the price of 1!! Note: There are 2 box base options with this template. The lid features a stunning window option, which you can choose to use the window cut out, or just decorate the lid as desired. 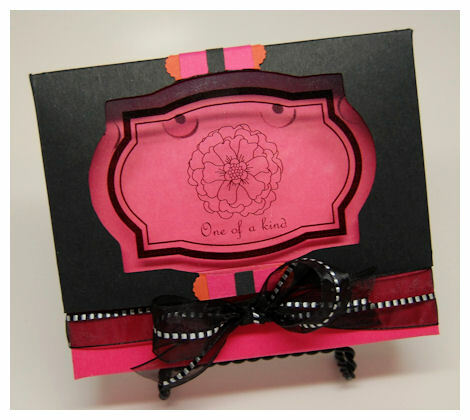 This Pretty Packaging was originally designed for you to package up those gifts that dazzle! This versatile box is sure to quickly become a favorite with its endless design options. This base features alterable cut out options, that allow you to display your gifts of jewelry (handcrafted or store bought) such as earrings, necklaces, bracelets, anklets or even rings. Alter the cut out options, as you see fit, to suit your gift! The lid fits perfectly over the top of the base. Due to the base angle, your items will fit inside perfectly. You an display items on one, or BOTH sides of this base! The optional window allows you to put your gifts that dazzle, on display! I wanted you to be able to see the printed window I created for the box window. 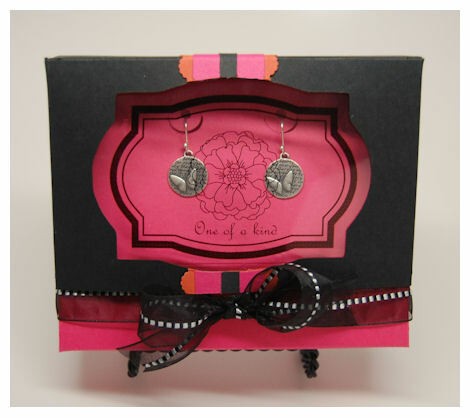 I designed my label on the box using the Be Dazzled Set. 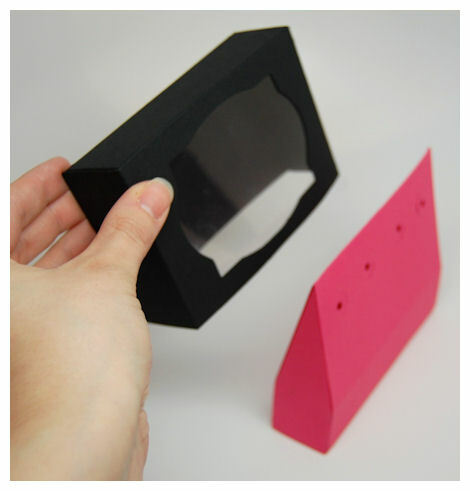 Once I created/layered my images, I then printed the label on my transparency sheet!!! Yes! You can print (in color too!) on transparency sheets! I get mine at Target, and they are by Printworks. Look how clear and crisp my image is. I will do one with full color at some point soon to show you how cool this can be! Now onto the jewelry display….. Here I am displaying a necklace and earring gift set. The rest of the necklace hangs into the box base. The base open on the bottom, so you can easily manipulate everything. The jewelry is displayed on an angled base, so that these items lay nicely against it, and really showcase the items displayed inside! It also allows your lid to slide over the top without getting stuck! Now how cool it is that you can choose to design and display your gifts already packaged up, or remove the window so they can be surprised 😀 This is great for all of you out there her design/sell jewelry, especially at craft fairs! 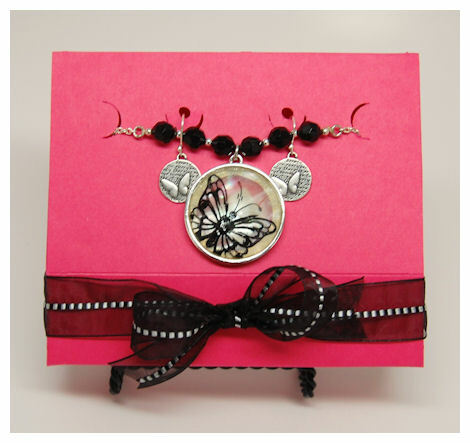 No more BORING jewelry boxes, that you already anticipate that there is jewelry in them before opening. 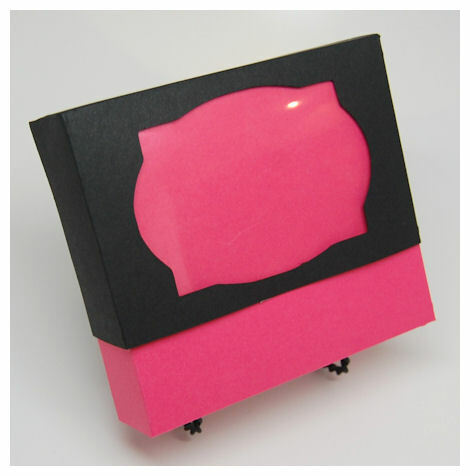 This is a far more fashionable, functional and FUN way to present such dazzling creations. You can alter the cut outs to suit your project needs as well. This base was altered to just hold earrings. The top is the same. 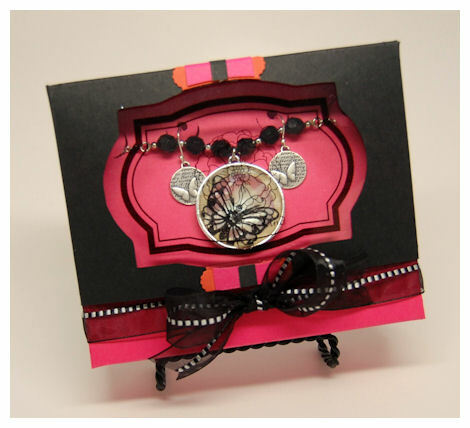 The window cut out was designed to coordinate with the Be Dazzled Pretty Impressions Stamp Set, and Be Dazzled Pretty Pieces Cut File. See the next project for details on that! This base is a boxed bottom, which is your 2nd base option. Simply put your gift inside. 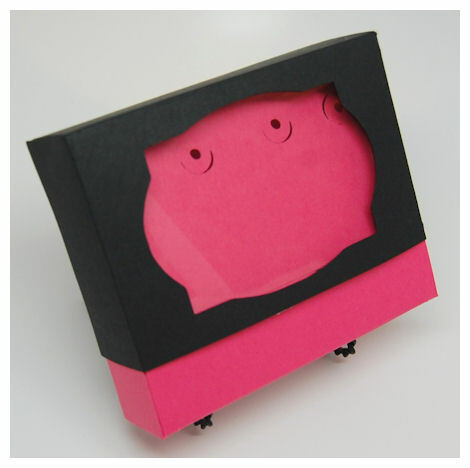 In this one I designed it a little differently, as my gift will fit IN the box base, instead of being on display. Now the gift ideas are truly endless. 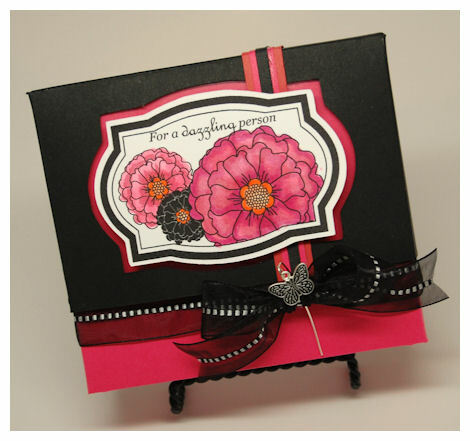 Be sure you check out the Be Dazzled Pretty Impressions Stamp Set, and Be Dazzled Pretty Pieces Cut File, as these were used in my samples today. Let me share the stamp set details now! Have you longed for the perfect set of images to compliment and dress up your gifts that dazzle? Then this is the set for you! For all of you out there who make, sell, gift, or package handmade or even store bought jewelry, this is the set for you! There are many sentiments in the set to help you describe exactly what you have gifted/created. You can layer the sentiments and use them with the tag images in the set. There are some floral images and 2 labels within the set. 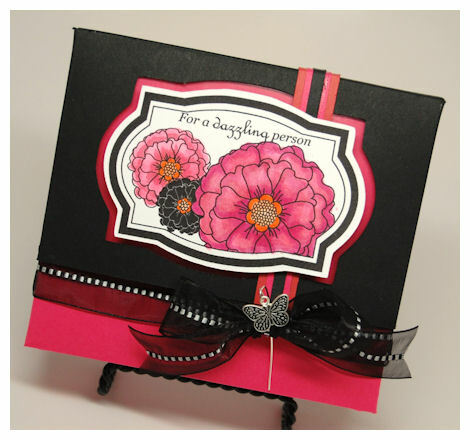 I love all flowers, and thought that this set could use a few flowers to accent the amazing set of sentiments. I just created my tag, then colored it with my Copic Markers! 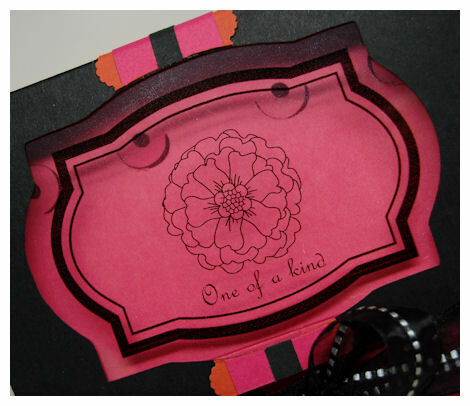 I used the same tag frame as in the transparency window project above, only on this one, I printed my floral label, adding the sentiment “For a dazzling person”, and cut it out using the Be Dazzled Pretty Pieces Cut File. The large label fits perfectly into the labels in the Be Dazzled Digital Stamp Set. 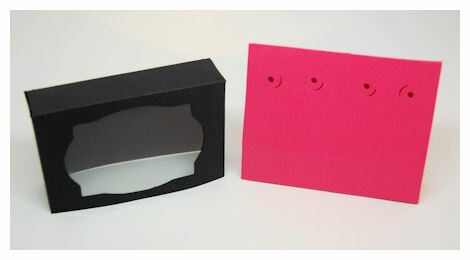 The large label has many uses, but was made to perfectly accent and decorate your boxed gifts. The smaller tag (not shown here today) was made for you to label your gift item! It is perfectly sized to hang off your dazzling gift. 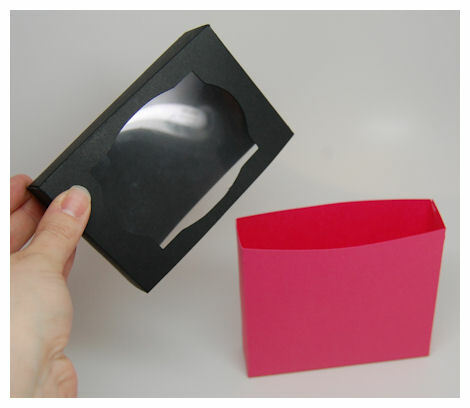 You may want to check out the amazing For Keeps Pretty Packaging Template (shown above), as that was created to fabulously feature your dazzling gifts of jewelry, or other items you wish to package. 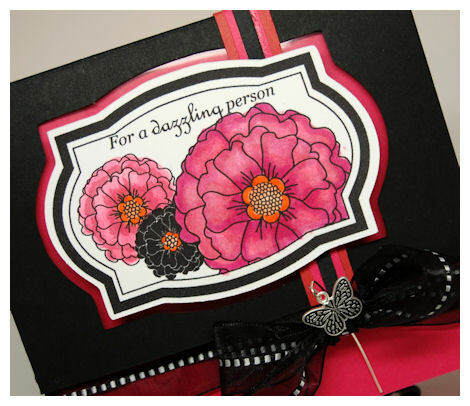 Be sure you also check out the Be Dazzled Pretty Pieces Cut File, as it was designed to cut the 2 tags in this set. 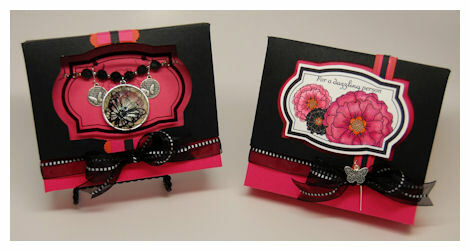 This is a set of 2 tags, designed to coordinate with the tag images from the Be Dazzled Pretty Impressions Stamp Set. These 2 tags are perfect for all your paper crafting needs be it for adding to your cards, frames, scrapbook pages, gifts, and of course any of your Pretty Packaging creations! Well that is a lot to take in, in one day, so please come back tomorrow for our July Release, where you will be able to see even more projects and get all the details on our latest release. There is another template to share, and lots more ideas, so see you tomorrow!